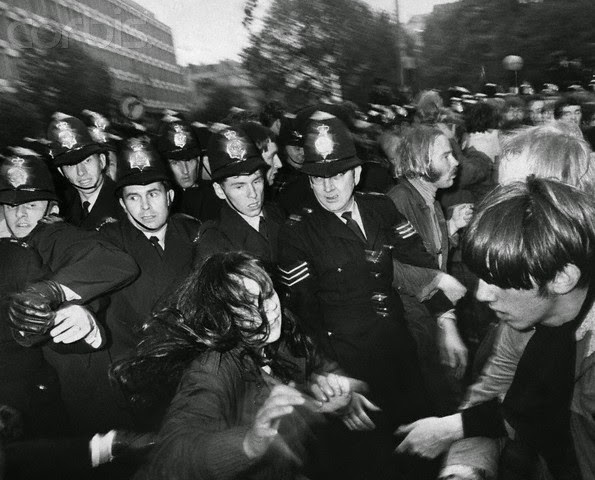 Kunzru's quote is from his novel of late 60s/early 70s radical politics, in which the narrator describes taking part in the anti-Vietnam War demonstration by the US Embassy in London's Grosvenor Square. But that exhilarating noise of history, the sound of the crowd in motion, has been heard in many times and places. Henry Cow's 'Nine funerals of the Citizen King' is a track on their 1973 debut album 'Legend' and signalled the radical critique which they carried forward until breaking up five years later. The lyrics reference Lewis Carroll ('the Snark was a Boojum' from his poem 'The Hunting of the Snark'), Gertrude Stein ('a rose is a rose is a rose') and Shakespeare ('O, gentlemen, the time of life is short!...An if we live, we live to tread on kings', Henry IV, Part 1). The latter was also quoted in Guy Debord's 'The Society of the Spectacle' (1967), and as the song refers to the 'spectacle of free' I wonder whether Henry Cow had been reading Debord. If so they were ahead of their time - the first English translation of 'The Society of the Spectacle' was made by Black & Red (Detroit) in 1970, but it was certainly not widely known. The line 'we'll work to live to buy the things we multiply, until they fill the ordered universe' could have come straight out of Debord, or even an Angry Brigade communique from the same period. Once upon a time my punky self would have dismissed this as 'prog'. But I was so much older then, I'm younger than that now. Oh and they played a benefit for Brixton Socialist Club in 1978. Tues. 7 February: striking workers sacked at Phillips Rubber Ltd in Manchester. Thurs. 9 February: Yuri Andropov, General Secretary of Soviet Communist Party (1982-84) dies. Mon. 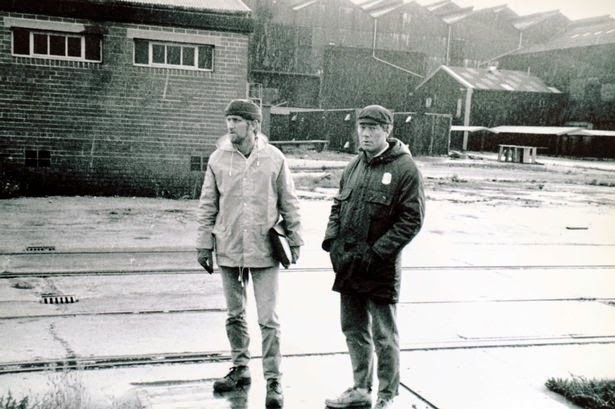 20 February: strike by miners in Doncaster area following merger of Goldthorpe and Highgate collieries (workers from two pits were not paidbeing the same). Miners also walk out at Manvers Collliery in South Yorkshire in dispute over meal breaks, supported by strikes at six other local pits over the next week. Mon 20 February: NUM delegates meeting in Edinburgh votes against strike against closure of Polmaise, despite support fro strike by NUM president Mick McGahey (GH 21 Feb) . By this time rumours of hit list of pit closures were rife, but Scottish miners were reluctant to strike on their own. Tues. 21 February: two members of the IRA and British Army soldier killed in a gun battle between an undercover BA unit and the IRA at Dunloy, County Antrim. Thursday 23 Feb: two Greenham women say they are shot at after cutting through fence. An American patrol fired two shots after the women refused to lie face down. They are arrested but unhurt (GH 28 Feb). Government denied shots were fired. Friday 24 Feb: British ariways cabin crews stage 24 hour lightning strike against 4% pay offer. Some wear 'I am a flying picket' bibs. Friday 24 Feb: Police and troops saturate the funeral of IRA volunteer Henry Hogan in Dunloy, shot dead earlier in the week. There are scuffles as police block the mourners path - supposedly to prevent IRA firing shots over the coffin (GH 25 Feb). 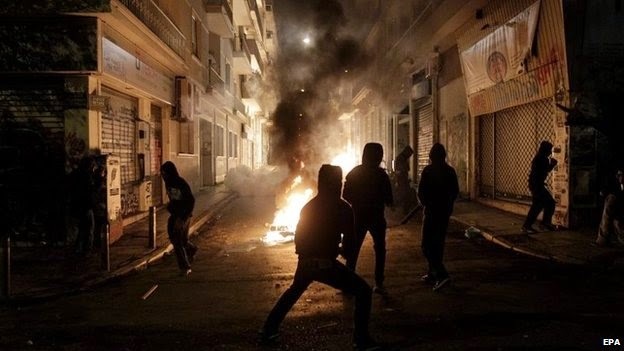 Demonstrators gather outside the university on 6 December, the 6th anniversary of the killing of 15 year-old Alexis Grigoropoulos by police. 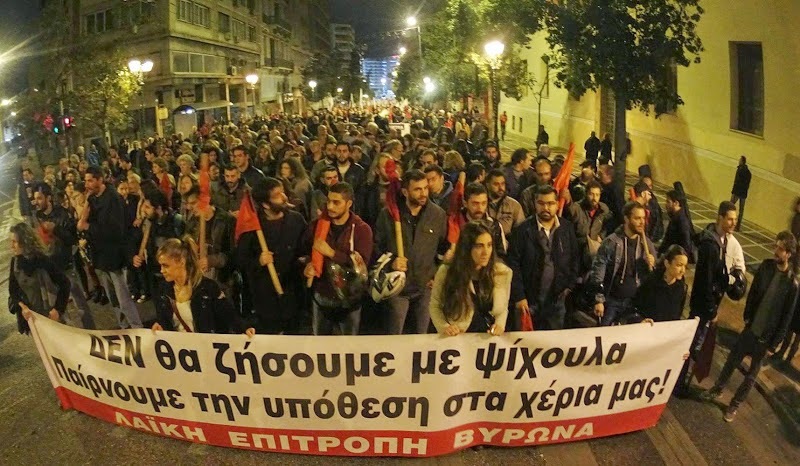 Thousands took to the streets to remember Alexis and to express solidarity with his friend Nikos Romanos, on hunger strike in prison (the hunger strike has now ended).